Happy Birthday Grace and a Happy Easter to You and Yours! Very cute & happy birthday! Happy birthday and happy Easter. I hope your day is full of surprises. And a fabulous happy birthday to you Ms Grace! Happy birthday! 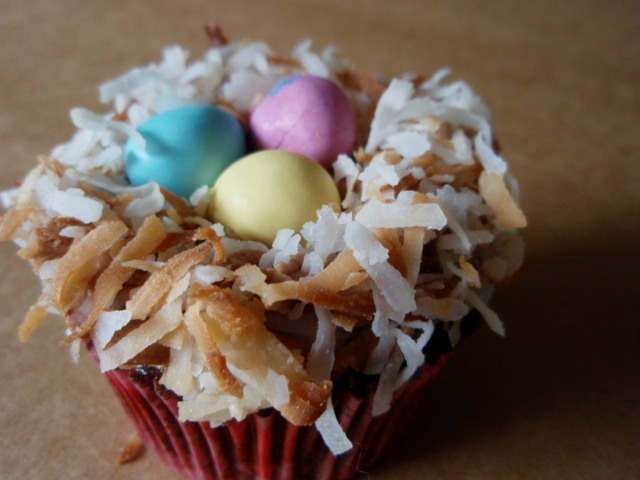 I love the toasted coconut on top of this cupcake. Aww happy birthday love! Hope you're eating a serious amount of cake! Happy Birthday and Happy Easter to you, my dear! Belated Happy Easter AND Birthday!! Happy Birthday, Grace - adorable cupcakes. Happy Easter.... but more importantly Happy Birthday! Many happy returns, and many more cupcakes! Happy Belated Birthday dear Grace! I see you celebrated appropriately with cupcakes. Here's to many more (birthdays and cupcakes). Happy belated Grace! I hope you had a fun Easter/birthday! I was on a plane flying home on Easter. Let me tell you, the inflight meal did not include anything like THIS. Wahhh. Happy belated Bday!!! Hope your day was filled with sweets!! Hope you had a wonderful birthday, and a great Easter too. Your birthday is on Easter? Awesome! Happy Easter and Happy Birthday! QUERIDA GRACE FELIZ CUMPLEAÑOS GRANDES AUGURIOS ,PARA USTED PAZ Y AMOR,ABRAZOS HUGS,HUGS. Happy Birthday! Cheers to a great Birthday week!! Hope you had a happy birthday and a wonderful Easter Grace. I love those cute cupcake nests! Happy birthday! Hope you celebrated in style. Happy Belated Birthday, and hope you had a wonderful Easter! Oh dear, I'm 9 days late, but happy birthday! Love this little treat, too! Happy Belated Birthday. Hope you had a wonderful day.That cupcake is so adorable.